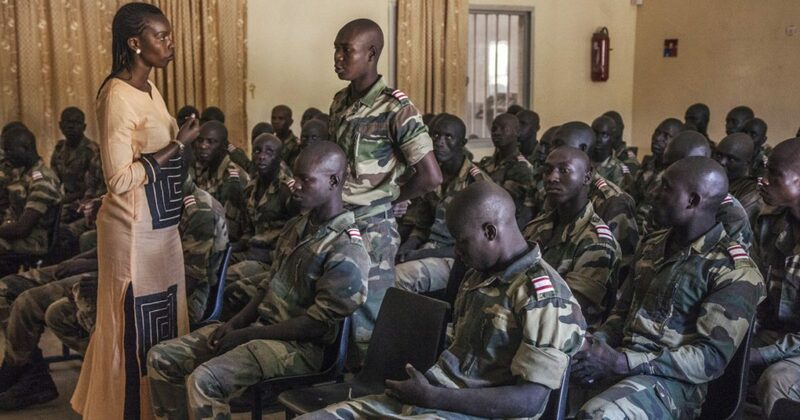 IHL dissemination given by the ICRC to the Armed Forces of Senegal, Saint-Louis region, 11 March 2016. In situations of armed conflicts and violence across the world, humanitarian actors operate amidst recurring violations of international humanitarian law (IHL). Not only do they witness breaches of the law in their daily work, but they are also the victims. While improvements in accountability have occurred over recent decades (notably through the criminal prosecution of individuals by national and international courts), existing compliance mechanisms face significant limitations. This shortcoming increases the burden on humanitarians to generate respect for the law, both on the frontlines and in the international arena. Thankfully, they have the means to help ensure IHL is complied with. From 12-16 September 2016 the ICRC convened aid workers from across the world and the humanitarian sector, for the 20th ICRC Course on IHL for humanitarian practitioners and policy makers in Naivasha, Kenya. The closing event, held in Nairobi and entitled “Challenges and opportunities for generating respect for the law: The role of humanitarian actors”, was part of ICRC’s series of events on Generating respect for the law. Amidst recurring violations of IHL, strengthening compliance with its rules and other norms applicable in armed conflict remains as indispensable as ever to the protection of civilians. The responsibility and capability of humanitarians to generate respect for the law comes firstly from their position as influential interlocutors to States. If only because “governments sometimes forget,” said Caroline Njuki from the Intergovernmental Agency for Development (IGAD), “it is our role to bring back to their awareness” their commitments under international law. Organizations like IGAD support governments in implementing such obligations, notably through capacity building (e.g. by providing training on migration law to State officials in the Horn of Africa). Njuki advocates for an approach she refers to as the “role of champions”, consisting of lauding the example of the most progressive countries in championing international law, in the hope that other States will be increasingly driven to meet those standards. As an example of predilection, she cites Uganda who, despite a relatively low level of development and numbers of refugees exceeding half a million (.pdf), has provided an alternative to encampment through an open policy of integration which, Njuki says, has significantly bridged the separation between host and refugee community. When interacting with States, humanitarians have many more strings to their bow. As Colineau listed, aid workers can ensure respect for IHL by: calling for political will to take action in enforcing the law, notably by publicizing violations of IHL; promoting IHL, including the ratification and implementation of treaties; emphasizing the collective responsibility of States to respect and ensure respect for IHL; encouraging the issuing of commitments to comply with IHL; and much more. The wide array of means at the disposal of humanitarian actors often fall under what the ICRC refers to as prevention work, which begins in peacetime to avoid violations occurring when conflicts erupt. Preventing IHL violations is a multi-faceted endeavour enacted through various means such as the integration of IHL in programmes of civil instruction, military manuals and doctrines. A newer trend in the reflection on ensuring compliance with IHL is an eminently pragmatic one, one that becomes particularly relevant in view of the glaring lack of enforcement mechanisms. It consists of ‘speaking the language’ of the parties, in highlighting how respecting the rules of armed conflict serves their own interests. “It matters how you win,” Colineau asserted: disrespect for IHL has a negative impact on political and military objectives; on long-lasting solutions aimed at achieving peace; on development and reconstruction; and even on military budgets. Of course, several of the means identified so far would find similar resonance among non-state armed groups, which also count among the audience of humanitarians when generating respect for the law. States are only one type of actor in situations of armed conflict and humanitarians must likewise extend their engagement to all players, in order to generate an environment conducive to compliance with the law. “It is in our mandate and it is for our security that we have to talk to all groups,” said Colineau. This is why the ICRC has trained Free Syrian Army combatants in the law of armed conflict, just as it did in the past for Sudanese fighters, whichever party to the conflict they sided with. For Colineau, it is precisely “because we have created this relationship with all the parties” that the ICRC is still present in South Sudan today, able to move and deliver its exclusively humanitarian protection and needs-based assistance. Today though, the endeavour to engage with all armed groups is complicated by sheer multiplication and splintering. According to Dr Brian McQuinn, sociologist and co-research coordinator of the upcoming Roots of restraint in war study, the number of armed groups has been five times greater in the past six years than it was between World War II and the Arab Spring – and that is a conservative estimate. “That proliferation is unprecedented in modern times,” McQuinn said. While clear codes of conducts and modes of operation could be found prevalently among armed groups in the past – think of Mao’s and Che Guevara’s works on guerrilla warfare – the factors affecting group behaviour have become less scripted and consequently more elusive. Among today’s non-state armed groups, the chains of commands are seldom structured in neat vertical structures. Authority is rather diffused horizontally among one group and between groups as they ally, break-up, implode or recompose in various shapes and sizes, at a rhythm that observers may find hard to keep up with. The ICRC has long known that simply ‘disseminating’ IHL (in the sense of communicating about the Geneva Conventions, along with other relevant norms and legal resources) was not enough. Its 2004 study The Roots of Behaviour in War had made the case for the ‘integration’ approach, “which provides not only for IHL to be included in military policies, taught to officers and to the rank and file, incorporated into exercises and training but also, and more importantly, for the rules to be incorporated into the orders passed down through the chain of command”. Now how to go about this when the chain of command is informal, splintered or unknown? How can humanitarians better understand and influence the behaviour of horizontally-organized armed groups to comply with the law of armed conflict? This is one of the goals of the upcoming Root of Restraint in War study. In the meanwhile, the very act of being present wherever assistance and protection is the most direly needed, to perform humanitarian action despite hindrances and sometimes lethal risks – that, in itself, means spearheading the efforts to make the law of armed conflict come alive. Back to basics: Enhancing African adherence to the rules of war – Mutsa Mangezi & Sarah Swart, 4 October 2016. Generating respect for the law in Africa – ICRC event (video and report), 10 August 2016. ICRC conference series on Generating respect for the law (videos and reports), 2015-2016.
International Review of the Red Cross, Vol. 96, No. 895/896, “Generating respect for the law”.